The trio of Eddie Prévost (drums), NO Moore (guitarism) and bassist John Edwards (if 'bassist' captures everything it is that John Edwards can do) combines improvisation, free jazz, rock, and electronic sound into a sonorous aggregate that avoids collapsing into any one category, being something in its very own right. 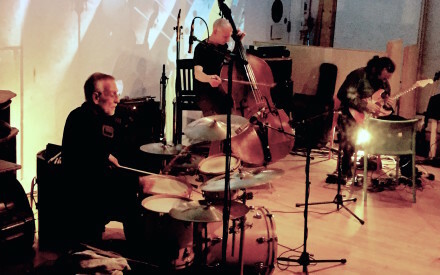 Following their well-received performance at Café Oto last month, propulsive rhythm, new sounds, and energetic improvisation will be the order of the night. Any expectations will be both met and mangled. NO Moore's guitar playing combines elements extracted from the short history of the electric guitar, from the Blues to Free Improvisation, and combines them with a love of early electronic experimentalism, synthesis, and musique concrète. The result is an often surprising sound world for electric guitar, encompassing both a loose respect for its traditions and an absolute commitment to the new and the consequences that follow.